HONOLULU (15 Dec. 2016) The Western Pacific Regional Fishery Management Council is hopeful that when President Obama arrives in Honolulu tomorrow, he will acknowledge the $100 million commercial fishing industry in Hawai‘i and the impacts on that fishery by his expansions of the Papahanaumokuakea Marine National Monument (MNM) in the Northwestern Hawaiian Islands (NWHI) and the Pacific Remote Islands MNM, which includes nearby Johnston Atoll. The value of the Hawaii longline fishery is excess of $300 million when factoring in retail markets and support industries and their employees. The National Marine Fisheries Service’s Pacific Islands Fisheries Science Center has reported that the expanded Papahanuamokueakea MNM may account for a potential loss of about 2.5 million pounds per year of tuna and other pelagic species worth on average $8 million, more than $9 million in fishery support businesses (e.g., fuel, gear, ice, etc. ), $4.2 million in household income and $0.5 million in tax revenue and affect more than 100 jobs. The impact will be much greater on fishermen who historically utilized the US waters around the NWHI as their primary fishing grounds as well as smaller boats that are restricted in their range. Given these economic impacts, the Council believes that prohibiting commercial fishing in this area should be phased in. 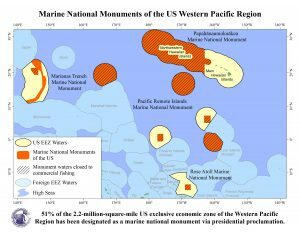 On Dec. 1, 2016, the Council sent its fifth letter to Obama about its concerns with the NWHI MNM expansion and a sixth letter about the impacts of the three other marine national monuments that have been proclaimed in the US Pacific Islands. The Rose Atoll, Pacific Remote Islands and Marianas Trench MNMs impact the fisheries of not only Hawai‘i but also American Samoa, Guam and the Commonwealth of the Northern Mariana Islands (CNMI) as well as local and US mainland seafood consumers. The Obama administration has not responded to any of the Council’s previous four letters, which were sent over the past nine months. Presidential proclamations through the Antiquities Act have banned commercial fishing in 61 percent of US waters around the Hawaiian Islands and have placed 51 percent of US waters around the US Pacific Islands under MNM designation. The Antiquities Act requires that monuments be proclaimed for the smallest size needed for conservation of resources of scientific and cultural interest. Obama has invoked future climate change impacts on biodiversity as one of the primary reasons for the presidential action in his proclamations expanding the NWHI and Pacific Remote Islands MNMs. Climate change impacts occur over much larger areas than contained in any marine monument. The Council believes climate change impacts will not be mitigated by prohibiting the commercial catch of a well-managed and enforced US fishery in discrete areas of US waters. Furthermore, the Council has repeatedly questioned the use of the Antiquities Act for marine conservation of tuna, billfish and other highly migratory species, which move well beyond the monument boundaries. “The Antiquities Act process circumvents the National Environmental Policy Act and the Magnuson-Stevens Fishery Conservation and Management Act, both of which require environmental, social and economic analysis and public input,” notes Council Executive Director Kitty M. Simonds. Prior to the expansion of the NWHI monument, which spans an area four times the size of Texas, about 10 percent of the fishing effort of the Hawai‘i longline fleet were in these monument waters. Another 10 percent were in the US waters around nearby Johnston Atoll, which Obama closed to fishing when he expanded the Pacific Remote Islands MNM in 2014. 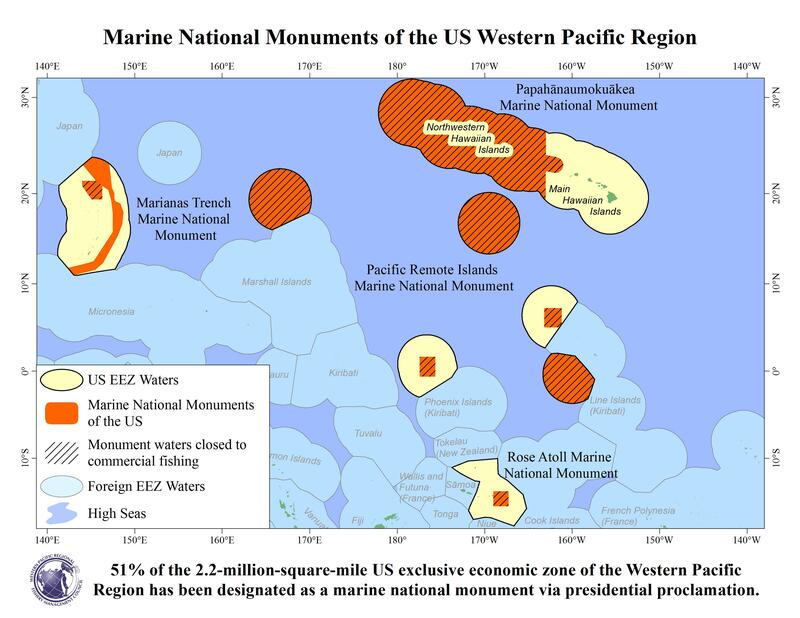 While the local governments have received no economic benefit from the monuments, NOAA and the US Fish and Wildlife Service have been receiving $3 million per year for “monument management,” notes the Council’s letter about the Marianas Trench, Pacific Remote Islands and Rose Atoll MNMs. At the same time, the US Coast Guard and NOAA Office of Law Enforcement have not received additional funds or assets to increase patrols of the monument waters.. The Council was established by Congress in 1976 and has authority over fisheries seaward of state/territory waters in the US Pacific Islands pursuant to the Magnuson-Stevens Act. For more information and to download the letters, go to www.wpcouncil.org, email info@wpcouncil.org or phone (808) 522-8220.